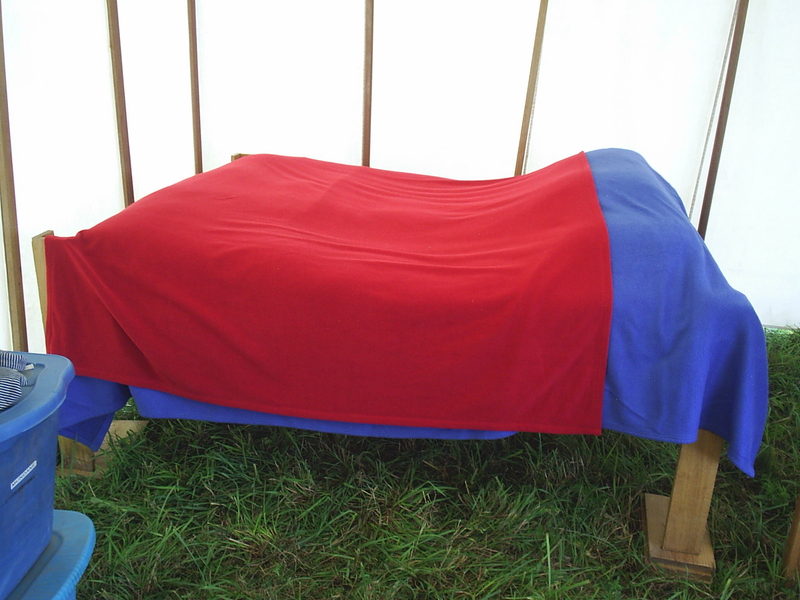 When we started camping in period pavilions we asked our friends what sort of beds they were sleeping on. And this is the bed that we settled on. It is not period, but it is comfortable, sturdy and easy to break down and set up quickly. When it is “dressed” it can look as plain or fancy as you want it to. 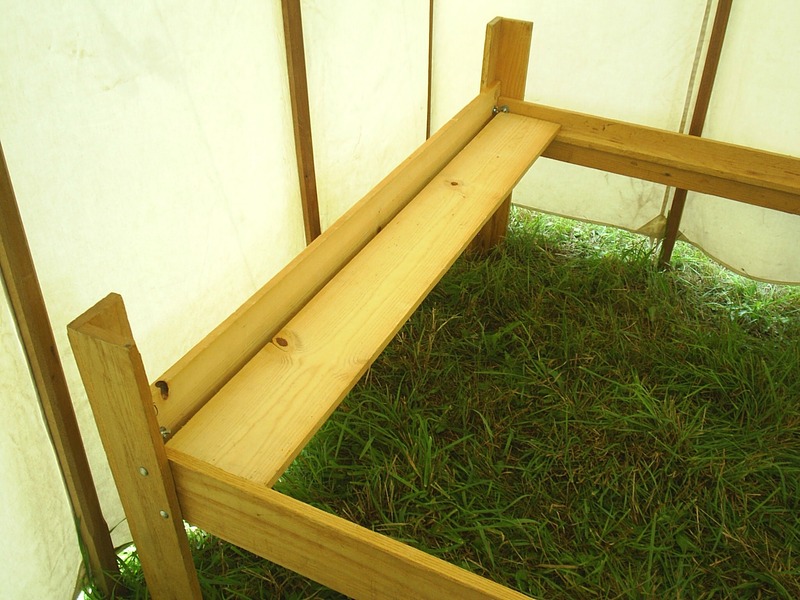 It would also be simple to extend the top of the legs up to create a four poster bed. We always cover our pillows completely during the day to keep them clean. First decide how large a bed you are going to make. Measure the mattress and make the bed at least 1 inch larger in both directions. This gives you room for your covers to be tucked in around the mattress. Here is a picture of the leg construction, from the bottom. 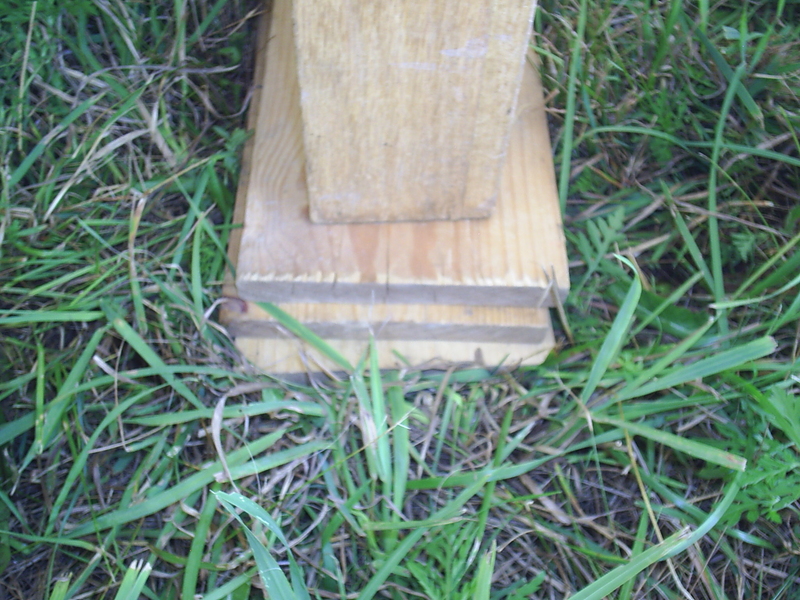 The leg is made of two pieces of wood with a third piece acting as a stabilizer. All three pieces are glued and screwed together. 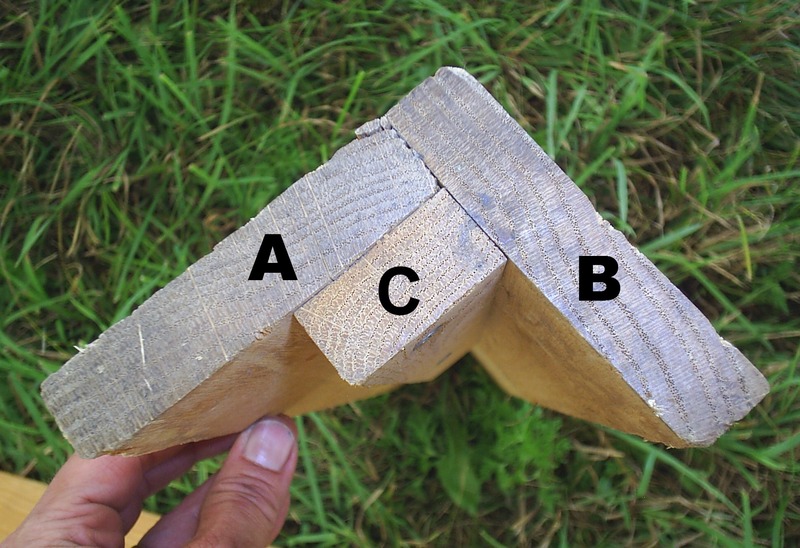 A and B are the same height and C only goes up to the level of the side rails. The rails will actually rest on C when they are bolted in place. You need to decide how tall you want the legs to be. Ours are tall enough to allow us slide our storage tubs under the bed. This is the way the headboard and foot board of the bed are assembled. 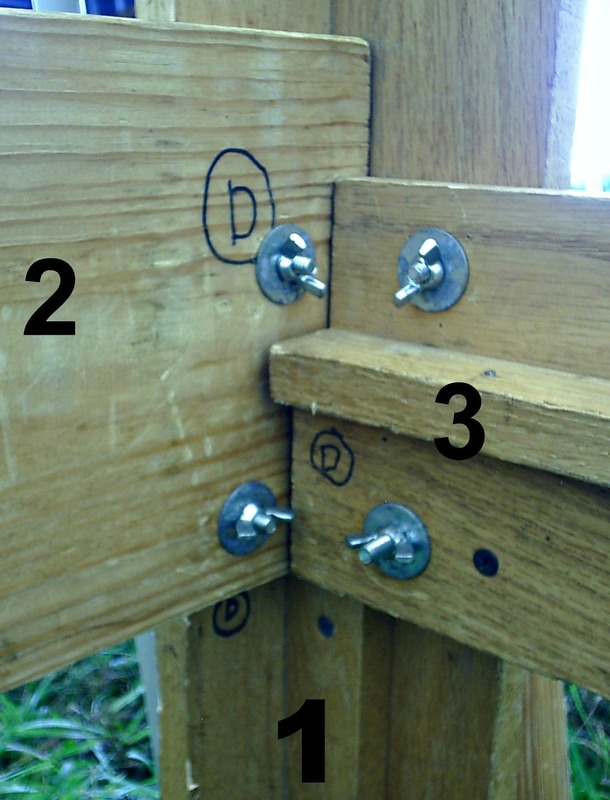 Four bolts, with washers and wing nuts hold the legs to the headboard. 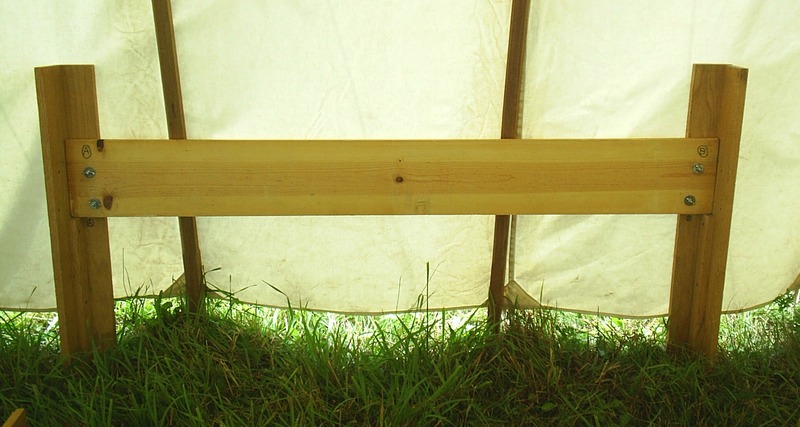 The side rails of the bed are also made of several pieces of wood. C is the actual side rail, B is the shelf that the bed boards rest on, and A is a stabilizer for the bed board shelf and also stiffens the bed rail. When the side rail is in use board C is vertical. This next picture shows the side rail in place. You will notice that each one of the pieces is marked with the letter D. That makes it easy to find all of the pieces and assemble them quickly. No matter how careful you are about drilling your holes, each corner of the bed will be slightly different. Any system that allows you to keep the correct pieces together will work. The distance from the bottom of boards 2 and 3 to the ground determines the height of the items that you can easily slide under the bed. The next picture shows the bed frame with a single bed board in place. The mattress will rest on top of the boards when they are all in place. If you are using an air mattress I recommend that you put an old blanket or canvas tarp on top of the bed boards before you put the mattress in place. You will need to protect the air mattress from splinters and the bolts in the corner of the bed frame. If you are camping in cold weather placing a survival blanket under the mattress will help keep you warmer. Once you have put all of the boards into the frame you can put the mattress in place. The mattress actually sits down into the frame, so that it does not slide off. 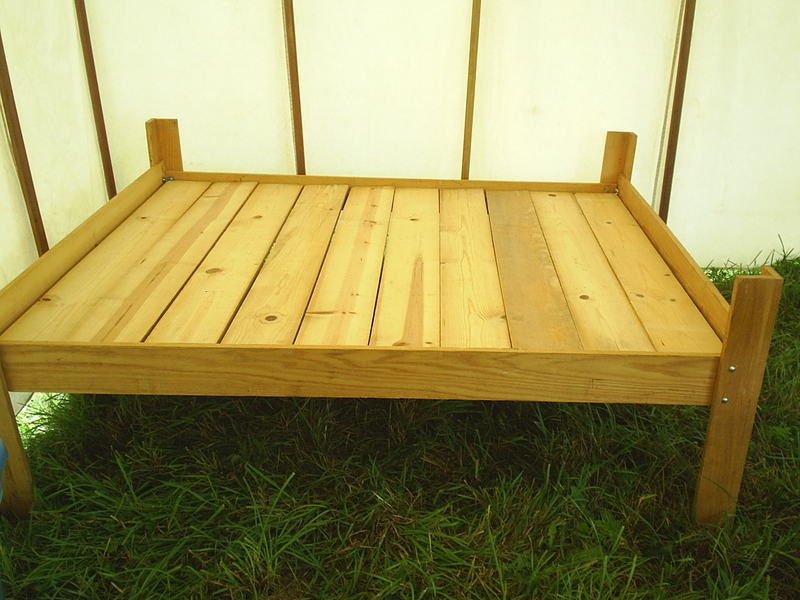 Now that you have seen the basic process, you or some other handy person can easily make one of these beds. There is another very important hint that you may be able to spot in the picture above. The bed, if properly constructed, will be square and will work perfectly on level ground. But when was the last time that you camped on perfectly level ground? Save the cut off pieces of boards from your projects and always carry some with you. Whether you are on a slight hill, or you have a hole under a single leg, the boards will make your bed a much more comfortable place. 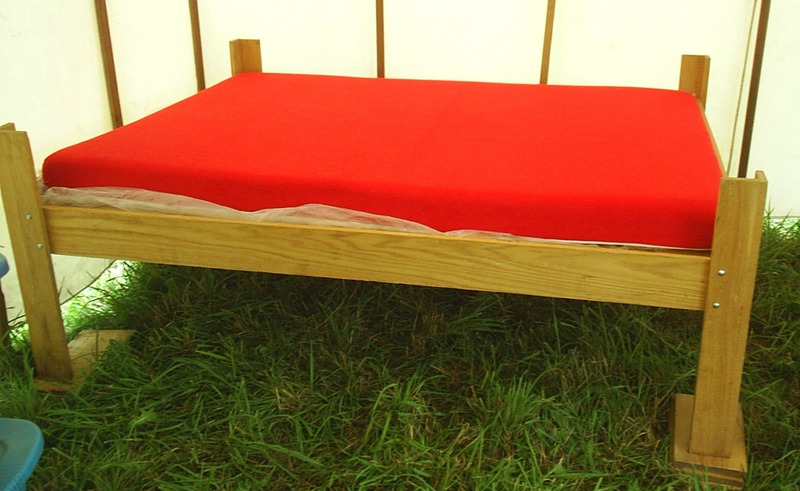 I hope this blog series has given you some good ideas about what you would like to do with your own camping bed arrangements.